U2 has left behind the glitz and theatrical performances that alienated much of their fan base during their last few releases and returned to the classic (yet updated) rock sound that propelled them to international fame in the first place. The band�s latest release, All That You Can�t Leave Behind and the supporting Elevation Tour have lifted U2 back into the spotlight as they enter their third decade of performance. The tour stop had Atlanta in the kind of buzz that can only be generated when the world�s greatest rock band is in town. Despite a tremendous opening performance by Nelly Furtado, the sold-out crowd of 18,000 had only one thing in mind, elevation. U2 entered the arena with no musical fanfare or glaring spotlights. The house lights were up as the band took their positions on stage. It took no time at all to see that this night would be one of mutual appreciation. Bono stomped, danced and strutted along a heart shaped catwalk that extended into the audience from the stage as the band gave the fans a mix of new and old songs that would have been labeled �U2 Favs� if it were a home burned compilation CD. �Elevation,� �Beautiful Day,� �Stuck in a Moment You Can�t Get Out Of,� �Walk On," �In a Little While� and �New York� from the new album were all performed. The show chronicled most of the group�s career, including an inspired version of �I Will Follow� from their 1980 album, Boy. Two particularly memorable performances came from material off of The Joshua Tree album. 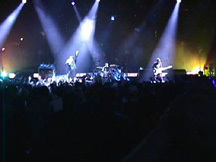 The arena took on an almost revival atmosphere during �Where the Streets Have No Name.� With the crowd's vocal participation, one could almost catch a glimpse of heavenly choirs singing �hallelujahs.� On �Bullet the Blue Sky,� Bono wielded a hand-held spotlight. With the remaining lights extinguished, he panned the crowd, the band and the sky in eerie fashion as he sang. U2 covered two INXS songs in memory of their friend, the late Michael Hutchence. Other songs from the set list were �Mysterious Ways,� �Staring at the Sun,� "Discotheque," "Sunday, Bloody Sunday," "The Sweetest Thing," "With or Without You" and as a tribute to members of REM in the audience, "Losing My Religion" as an intro to "One." Any doubts held by those in attendance of U2 being the biggest rock stars currently on the planet are now vanquished. It was an amazing concert full of inspiring performances. U2�s success has nothing to do with a well oiled PR machine, the whim of current musical opinion or luck. They create and perform incredible music. Despite the lyrical claim, �I can�t sing but I�ve got soul,� U2 continues to prove they have both talent and passion.